I’d never heard of Jenny Diski until she died. When she passed away almost exactly a year ago, my Twitter stream was abuzz with tributes to her, such that (given the sort of people I follow on Twitter) I actually thought that she was an obscure, if well-loved, member of the Scottish writing community. Turns out she was not – she’s English, and you can read her history on her Wikipedia entry – and she was really very widely known. Albeit not by me – but then this whole project rests on the premise that I really don’t know very much when it comes to female travel writers. I lazily scanned one or two obituaries at the time, and saw links fly past on Twitter to some of her works, but I confess I never had the motivation to have a read. That came when I put out the appeal for reading material for this year-long quest, and Twitter contact Rachel McCormack mentioned her, and I recalled the name from the time of her death. 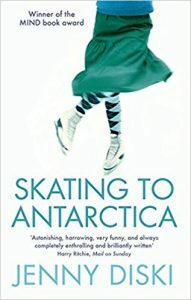 I actually had other recommendations of Antarctica-based travelogues for my reading list, including the books of Sara Wheeler, but as my curiosity had been piqued by the great acclaim lauded on Jenny DIski, and I decided there was only really room for one Antarctica title on my list, I plumped for Skating to Antarctica. I’ve not quite got far enough into the book to figure out quite what Diski gets up to on her adventures, but the chapter I’ve read so far – and the back page blurb – speaks of an inner journey as much as a literal one. Diski opens by talking about her challenges with mental health, her difficult upbringing and her obsession, for reasons so far unclear, with the pure whiteness of Antarctica. At once, the opening feels like a mix of Amy Liptrot’s superb memoir about addiction, landscape and human nature, which I reviewed here, and Tete-Michel Kpomassie’s breathtaking travelogue An African in Greenland, which I reviewed here. Diski’s dreamy prose works equally well when exploring her mental state as much as her visceral lust for the empty expanse of Antarctica, and no doubt the two contribute to and feed each other. It will be interesting to see, as I continue reading, how much those two strands of thought – the inner and the outer journeys – balance out and validate each other throughout the adventure, and also whether my comparisons with The Outrun and An African in Greenland stand up at the end of the book. I’m gripped by Diski’s flowing, thoughtful narrative already, and suspect I will continue to enjoy it – albeit in a way tinged by the knowledge that she has so relatively recently died and so no more words will come from her. Diski has, at the point I’ve read up to, not yet reached Antarctica. So I don’t know how she will portray it or what she will find there. She in fact, just about to head off. So I will end this review, pick up the book, and immerse myself in her journey.